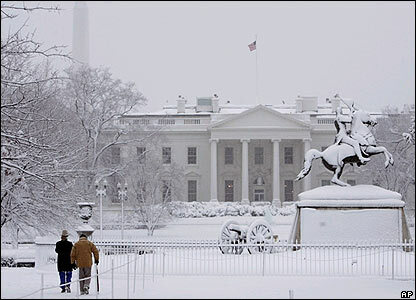 Washington, DC is emerging from its winter wonderland of nearly two feet of light powdery snow over the weekend. With snow crested on rooftops and banked along the streets, with sparkling lights blinking around town, circling the monuments and the White House, the city looks like a postcard for the holidays. Over the weekend if you didn’t have to travel, the record snowfall—between 15-20 inches, the largest ever in December—was magical. We walked into a restaurant with a fire place, met with family and friends for lunch then played in the park with our family dogs—one old dog and two puppies—who jumped and romped and tumbled through the snow as if it had fallen for their pleasure, theirs and the children who were sledding down the hill. But the snow has now begun to melt during the day and to freeze at night, leaving crusty, icy mounds. From the window it is still beautiful, but it is a pain if you are trying to park a car at the curb or walk along paths not dug out when it was fluffy. The holiday lights still blink, and the puppies still race across the white fields as if life was all that it was meant to be. And yet as I sit here typing this December blog, trying to settle into the holiday spirit, I am acutely aware that half a world away a trial is under way at this very moment in Beijing for a Chinese writer and dissident whose “crime” was to draft, along with other Chinese citizens, a vision–Charter 08–calling for human rights, rule of law and democratic reform in China. An important writer and literary critic, Liu Xiaobo was held for six months at a secret location, then formally arrested and transferred to a detention center in June, and finally twelve days ago indicted for “incitement to subvert state power.” He is being brought to trial today– December 23–less than two weeks after the indictment and on the eve of Christmas when many diplomats and journalists will be away. His motion to postpone so his defense could have time to read and prepare against the 20 volume indictment was denied. Liu’s wife was told she can’t observe the trial and has instead been named a prosecution witness. Across China activists and supporters of Liu’s have been warned to stay home and not participate in any activities in support of Liu. These actions have led China observers to conclude that the trial is purely political and a guilty verdict has already been determined. Around the world freedom of expression and human rights organizations and activists are preparing for the worst—a long jail sentence for Liu. A vigil has been called at the Chinese embassy in New York. Petitions are being prepared and at the same time lobbying continues in the hope for some recourse. At this holiday season when hope is celebrated and rebirth, anticipated, the voice of a single Chinese citizen echoes as light as snow falling on grass and as hard as the frozen earth beneath. China at 60–Fate of Liu Xiaobo? Congress should pass Resolution 151 to speak out on behalf of arrested dissident Liu Xiaobo. WASHINGTON – The People’s Republic of China celebrated its 60th anniversary today with massive military parades, fireworks, and concerts throughout the country. In mid-November, President Obama will make his first presidential visit to Beijing, marking the 30th anniversary of Chinese-US relations with an agenda likely to include the environment, security, and the global economy. In the time between these milestones, the fate of an individual Chinese citizen hangs in the balance and may well foreshadow future relations with China. Liu Xiaobo, one of China’s leading writers, intellectuals, and dissidents, is expected to come to trial and be sentenced after the anniversary celebrations and before the president’s visit. Resolution 151 should be passed with dispatch before Liu’s trial and sentencing so that it might signal to Beijing how much America cares about the lack of freedom in China. Liu was arrested last December and charged this June with “inciting subversion of state power” for his role as one of the principal drafters of Charter 08, a document that set out a democratic vision for China. Charter 08 was originally signed by more than 300 leading writers, engineers, teachers, workers, farmers – even former public servants and Communist Party officials. It was subsequently signed by more than 10,000 Chinese citizens. The document was circulated widely on the Internet, though it is now blocked in China. In a recent visit to Capitol Hill, writers from the Independent Chinese PEN Center, where Liu is a former president, as well as American writers, urged members of Congress to accelerate the passage of Resolution 151. The Chinese writers, who were in touch with Liu up until the day he was arrested, say that they believe a resolution by the US Congress would have a beneficial effect and help mitigate the severity of the sentence, which could be as much as 15 years. However, the resolution needs to pass before his trial and sentencing; otherwise it will come too late. Can this essentially symbolic gesture actually help Liu? The emphatic answer from his Chinese colleagues is yes. Even if he’s not released, Chinese authorities, sensing pressure from China’s chief trading partner, might give a shorter sentence to one of its leading thinkers and writers. Will this gesture complicate US policy toward China? The question instead should be: How can the US have a policy with China that ignores the imprisonment of major democratic activists? The release of Liu Xiaobo would be an enlightened act that the Chinese government could take in the wake of its 60th anniversary, signaling to the world that it is not afraid of ideas. Grandstands are rising around Washington, DC. The U.S. is preparing for the Inauguration of a new President whose campaign mobilized a record number of citizens and focused on themes of hope and change. Half way around the globe in the world’s most populous country, a relatively small group of citizens are proposing radical change for their nation, change which reflects in large part the ideals upon which the United States was founded. However, the proponents of this change have been interrogated and arrested. On December 10, the 60th Anniversary of the Universal Declaration of Human Rights, 300 leading mainland Chinese citizens—writers, economists, political scientists, retired party officials, former newspaper editors, members of the legal profession and human rights defenders–issued Charter 08. Charter 08 sets out a vision for a democratic China based on the citizen not the party, with a government founded on human rights, democracy, and rule of law. Charter 08 doesn’t offer reform of the current political system so much as an end to features like one-party rule. Since its release, more than 5000 citizens across China have added their names to Charter 08. Before the document was even published, the Chinese authorities detained two of the leading authors Liu Xiaobo and Zhang Zuhua and have since interrogated dozens of others who signed. Most have been released though they continue to be watched. However, Liu Xiaobo, a major writer and former president of the Independent Chinese PEN Center, remains in custody with no word of his whereabouts and fears that he will be charged with “serious crimes against the basic principles of the Republic.” The Chinese government has also blocked or deleted websites and blogs that carry Charter 08. Charter 08 was inspired by a similar action during the height of the Soviet Union when writers and intellectuals in Czechoslovakia issued Charter 77 in January, 1977. Charter 77 called for protection of basic civil and political rights by the state. Among the signatories was Vaclav Havel, who was imprisoned for his involvement but went on to become the President of the Czech Republic after the Soviet Union ended. Citizens around the globe, including Vaclav Havel, Nobel laureates, human rights defenders, writers, economists, lawyers, academics, have rallied in support of those who signed Charter 08. The European Union has expressed grave concern at the arrest of Liu Xiaobo and others. Petitions in support of Charter 08 and in protest over the detention of Liu Xiaobo are circulating around the world. The arrest of Liu Xiaobo happened on the eve of Human Rights Day and the 60th Anniversary of the Universal Declaration of Human Rights. The year 2008 is also the 110th Anniversary of China’s Wuxu Political Reform, the 100th Anniversary of China’s first Constitution and the 10th Anniversary of China’s signing of the International Covenant on Civil and Political Rights and the soon-to-be 20th anniversary of the Tiananmen Square crackdown against students. Charter ’08 is well worth reading. It sets out the political history of China in its forward, then proposes fundamental principles–freedom, human rights, equality, republicanism, democracy and constitutional law—upon which the government should be based. The document advocates specific steps–a new constitution, separation of powers, legislative democracy, independent judiciary, public control of public servants, guarantee of human rights, election of public officials, rural-urban equality, freedom to form groups, freedom to assemble, freedom of expression, freedom of religion, civic education, protection of private property, finance and tax reform, social security, protection of the environment, a federated republic, truth and reconciliation. Charter 08 lays forth an ambitious agenda, one that would revolutionize the political climate and governing structures of China, but it advocates for change not through violence, but through citizen participation. Is this naive? Foolhardy? Or is this vision for China one that will inspire and empower its citizenry? As citizens in the U.S. prepare to inaugurate a new President, the first African American President, the country is not so much realizing change as realizing in its electoral process the ideals set forth over 200 years ago. Ideas may be repressed for a time and their authors may be persecuted, but ideas and words matter. Eventually they are the fuel for the engine of change. Those who have the courage to set them down and publish them may turn out to be the founding fathers on whose shoulders generations will stand.